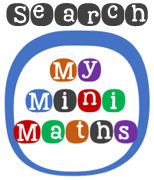 Welcome to the My Mini Maths TT38 Times Tables Skill Builder. The 10 day rolling program takes less than 5 minutes per day and will improve your accuracy and speed when recalling times tables facts. There are 4 different tasks included across the 10 day rolling program. 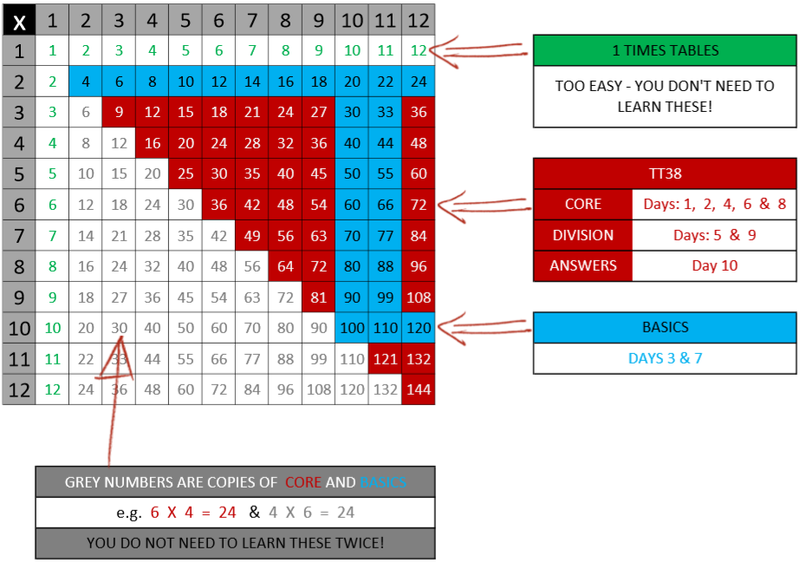 Includes the red CORE 38 times tables for you to practise as shown on the multiplication grid above. The Core skills are practised on days: 1, 2, 4, 6 and 8. Gives you the opportunity to practice the basic times tables not included in the Core 38. The Basics skills are practised on days: 3 and 7. Presents the CORE 38 times tables as division facts using fractions, giving you the opportunity to practice the core division facts! The Core division facts are practised on days: 5 and 9. Containing all CORE 38 answers for you to match the correct times tables to. See the bottom of the answers sheet for more information. The Answers are practised on day 10. Give yourself a maximum of 5 minutes to complete as many of the questions as possible. If you complete the sheet within the 5 minutes, record your time. Then check your answers and add 20 seconds for any errors. If you do not complete all of the questions within the 5 minute limit, again check your answers and add the number of errors to the number of unanswered questions. Record the final time or gaps on the pupil record sheet for the correct day. Complete the questions as quickly and as accurately as possible without a time limit and record the finish time. Then add 20 seconds for each error to arrive at a final time. Record this time in the correct day using the pupil record sheet. You will see an improvement in your scores and times as you practise.